Growing up in New Delhi, India, the mother of Wilsonville resident Priya Pandey wanted her to be an artist, while her father envisioned an engineering career. 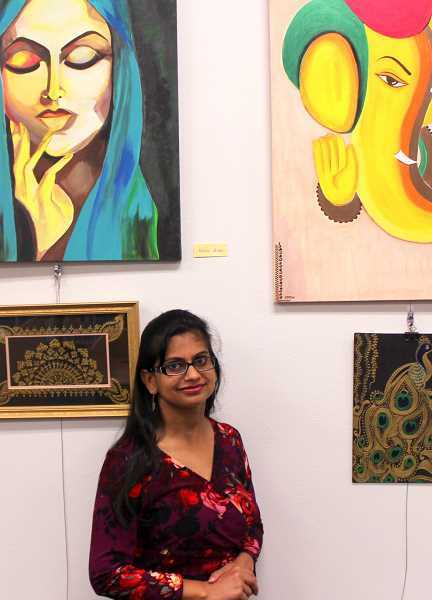 Pandey became an engineer for financial purposes, but — as exemplified by her display at the Wilsonville Public Library that will run through September — she didn't relinquish her artistic talent either. "I somehow pursued both of their dreams," Pandey said. Many of Pandey's paintings were inspired by Indian culture, Hinduism and female beauty. 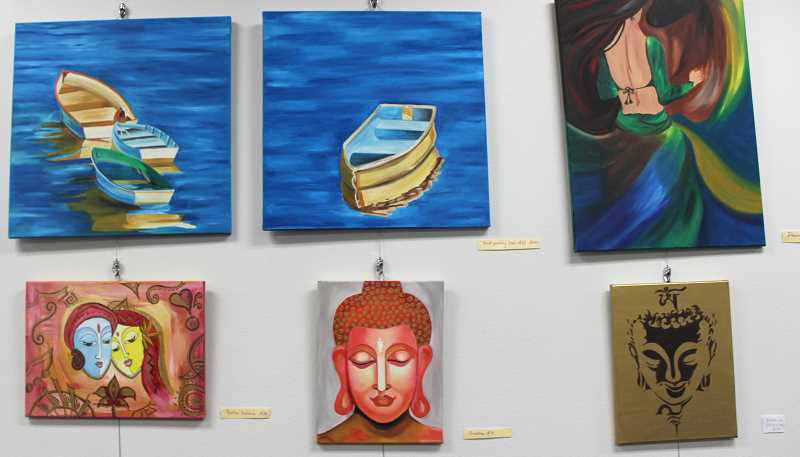 In her collection at the library, she included paintings of a Ganesha and other Hindu deities, a mandala (a symbol representing the universe) and Buddha. But she also featured paintings of boats, a belly dancer and a pensive lady. "I'm proud of the Ganesha painting hanging. I like it and the boat painting especially. I never thought I would be able to make it (the boat painting) so perfect. The kind of shades with the water and the waves ... I am so proud of it," Pandey said. She paints with acrylics and oil rather than watercolors and her process includes assessing a painting's dimensions, a careful drawing and imagining color combinations. "I draw and put a lot of effort into drawing because if that goes wrong the whole thing will be messy," Pandey said. "Watercolors are a little bit tricky but I like the oil finish. It looks better with the shine and the gloss in it." Her paintings evoke a radiant, colorful glow and Pandey said they're an expression of the inner love she sometimes struggles to express through words. "Most of the time I feel really short of words," Pandey said. "But when I canvas paints, I express the best me. I'm just lost when I'm painting." When free from juggling her job and family, Pandey paints. And her work has also been featured at the Wilsonville Festival of Arts. Encouraged by her mother, Pandey recalled attending art camps and competitions as a child. "I was really good at it ... That's what my mom said," Pandey said. And when FaceTiming her mom, who lives in India, Pandey still receives encouragement and constructive criticism. "She always encourages me or she tells me, 'This is wrong. You need to fix this,'" Pandey said. Her exhibit also features some mixed media and abstract paintings, though she has only dabbled in these mediums. "With every passing painting, I feel like I'm learning new things," she said. "I thought, 'It's not getting much exposure,'" she said. "You cannot hang the fabric on the wall."